Warm memories of community collaboration. Keeping up with the Steins (or the Hassons, or the Bar-Els for that matter) was not the issue when I celebrated my Bat Mitzvah; collaborating with them was! In 1980, in Caracas, Venezuela, no one in our circle of friends catered. People from the community got together and cooked! With the current downturn of the economy, families in the United States are looking for alternatives to the expensive parties they may have had in mind. Coming together as a community to prepare for a simcha is a very old tradition in many Jewish communities around the world. Not only are the resulting menus more interesting, but the bonds formed between people, and the sweet memories, remain strong for many years after the festivities. When we celebrated my Bat Mitzvah we were living in Venezuela, fifteen hours away by air from all of our relatives in Israel. In 1980, the Jewish community of Caracas was evenly divided between Ashkenazi and Sephardic Jews. My parents befriended people in the community from many different backgrounds. For my Bat Mitzvah, my mother, her friends, their daughters, and I all got together and cooked. As a result, the menu for my Bat Mitzvah was much more diverse than it would have been had my relatives in Israel been the ones doing the cooking. For me, the rejoicing began weeks before the big day, when everyone joined us around the dining room table to assemble the appetizers. We were making Moroccan Cigars (for eating, not for smoking!). As we sat together carefully spooning the meat filling onto the dough, we told jokes and talked about the upcoming party. The house was redolent with the smells of garlic, cilantro, and cinnamon. My mother fried up a batch of these crisp appetizers for us to taste. We could all hear them sizzling in the hot olive oil. So impatient were we to try them that we burned our fingers, lips, and tongues as we bit into the spicy delicacies. We played simcha music to enhance the excitement and anticipation in the air. The time our friends spent with us helping with the preparations was the best gift that I received for my Bat Mitzvah. To this day I carry the feeling of warmth and gratitude toward them for devoting their time and attention to me. My Bat Mitzvah celebration would not have been possible without them. I would love the opportunity to give today’s B’nai Mitzvah what was given to me. There are many ways to achieve this. It can be a potluck, where people are assigned dishes. Friends (including men and boys!) can congregate in one home and work together. When a bigger kitchen is needed, there are some synagogues that will accommodate members who would like to cook their own food for a simcha. At my synagogue, Germantown Jewish Centre, we have two kitchens. One is small, and is only for dairy and pareve dishes. If the party is held on that side of the building, then celebrants are allowed to bring pareve or dairy dishes from home. On the other side of the building is a much bigger, professional kitchen. Dairy or meat meals may be prepared in it. A mashgiach, or kosher supervisor, is required, and is contracted from the Rabbinical Assembly. Now that my own children are going through the B’nei Mitzvah phase, it is my privilege to be asked to bring something to their friends’ celebrations. I try to make the most memorable dish that I can. Most people in the States feel awkward about imposing on their friends and acquaintances, and yet I sense a yearning in many of the people that I know to give of themselves. My gratitude has not abated over the years. Our family friends’ example has stayed with me. I feel that by celebrating as I did in Venezuela, we can recapture the warmth of being part of a community. Family recipes are shared, and traditions mingled. A Bar or Bat Mitzvah celebration should be a time of pride and joy, not stress and pressure over money. I believe that I remember my home cooked Bat Mitzvah with more love and warmth than I would have any catered affair. 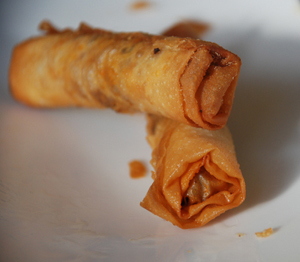 Moroccan cigars are appetizers served only on special occasions. Our friend Mercedes, who came to Caracas from Morocco, taught us how to prepare them. Chop the onion, and sauté in one tablespoon of olive oil. When the onion is soft and translucent, add the lamb and stir. Add the salt, cinnamon, allspice, ginger, black pepper, and red pepper flakes. Fry everything until the meat is cooked through. Add the cilantro. Whisk the eggs and then add them to the meat mixture. Cook for about two minutes. Set aside and allow to cool. When the meat mixture has cooled down, cut the phyllo dough into rectangles. Brush with olive oil, and then arrange some of the meat filling along one of the edges. Roll into a cigar shape and pinch shut. The cigars may be frozen until ready to cook. Fry the cigars in hot olive oil, then keep warm in the oven until ready to serve. Moroccan cigars are typically served with a Hummus dip. Put all the ingredients except the paprika in a food processor. Blend everything together until very smooth. Scoop into a bowl, and sprinkle with paprika. 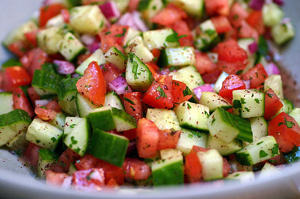 A very fun dish to prepare with a group of friends and family is Israeli Salad. Each participant will need his or her own cutting board and sharp knife. The cucumber needs to be peeled, and the peppers cleaned. The tomatoes, cucumber, pepper, green onions, and radishes need to be washed and diced. The cilantro should be very finely chopped. After all the vegetables have been chopped, add the lemon and lime juice and olive oil. Finish with salt and pepper to taste. This quantity of vegetables serves 6. If you have helpers, have each veggie prepared by one individual. All the salads can be joined in one big serving bowl at the end. One of the main courses served was my mother’s festive beef dish. It is an Israeli recipe that we would usually enjoy for Passover. Preheat the oven to 350 degrees F. Chop the onions, garlic, celery, and carrots. In a heavy pot, heat the olive oil over medium heat. Sauté the vegetables until the onion is translucent. Add the meat, salt, and pepper while stirring. Cover with water and bring to a boil. Seal the pot with aluminum foil, and place in the oven for four hours. Take out the pot and allow to cool enough to handle. Place the meat in a separate baking dish. Arrange the artichokes over the meat. Pour the sauce and vegetables into a food processor, and puree. Taste the sauce and check the seasonings. Pour the pureed sauce over the meat and artichokes. Cover the baking dish with aluminum foil and return to the oven. Serve when hot. 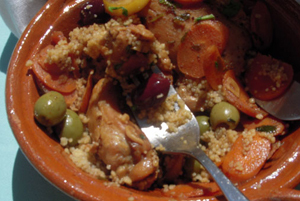 Tunisian chicken with lemon and olives. Heat the olive oil in a wide pot. Thinly slice the onions, lemon, and carrots, and chop the garlic. Add to the pot and stir for a couple of minutes. Add the chicken and sprinkle the red pepper flakes, turmeric, coriander, saffron, ginger, cumin, cinnamon, and paprika over it. Add the olives and two cups of water, and bring to a boil. Cook over low heat for about 20 minutes, until the chicken is cooked through. Finely mince some cilantro, and sprinkle over the chicken. This dish may be refrigerated and reheated when ready to serve. Heat the olive oil in a pot. Add the rice and salt and until hot. Add the water and bring to a boil. Cook on low heat for about 45 minutes, until the water has been absorbed. Fluff and serve. 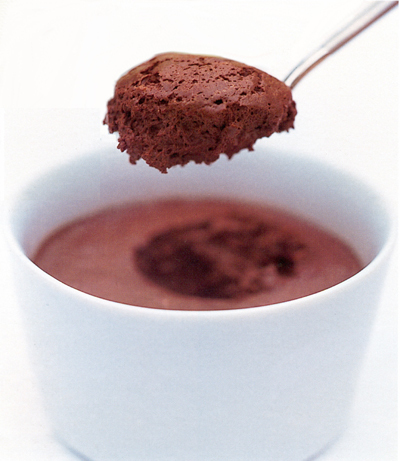 Pareve Chocolate Mousse with Venezuelan Rum. Boil water in a small pot, and place a bowl over it to be warmed by the steam. Mix the chocolate and margarine in this bowl until they melt. Add the coffee mixture and blend well. In a mixer, whip the egg whites with 1/2 cup sugar until very stiff. Add the yolks to the chocolate mixture. Add the rum to the chocolate mixture while stirring. Slowly fold the chocolate mixture into the egg whites. We live in a very fluid society, where families may live far away from their other family members. By cooking together as a community, we all become a little bit like each other’s family. A joyful, delicious celebration becomes possible for every teenager in the community. The Bar or Bat Mitzvah celebrant experiences the ancient Jewish tradition of “kol Israel arevim ze laze,” or “all of Israel are responsible for each other,” as part of their welcome into the community as adults. These memories last a lifetime, and the example is set of how to be a mensch. When someone becomes a Bar or Bat Mitzvah it is not just their simcha, it is everyone’s simcha. So let the cooking and kvelling begin!